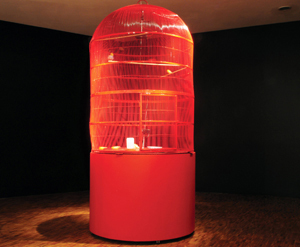 The project shows, in real time, a non-linear sound installation that reflects in time-space an absence of a previously determined script.To explain the operation of the "China" piece, it is important to mention that the 10 live canaries inside the red cage work as sound algorithms, since the movement and the random song of these birds activate different modular frequencies of the piece, which become unexpected and create other dynamics in time-space. That is, the actions of the animals do not show, at first sight, any apparent order, but if we finally were to know the system that governs the initial conditions, it would be predictable and describable. However, the installation proves, one way or another, how underlying the canaries can be, since they are within a radio frequency perimeter; therefore, every movement from the animals in this range, becomes a modular frequency.There is also an espionage microphone monitoring the birds’ sounds to detonate frequencies, which are, in turn, mixed together with the frequencies that have been digitally transgressed and that emanate from the two Theremins, all of which helps to unify the final piece.In summary, the installation shows, directly and formally, a piece of sound art that intends to reflect in its genesis a particular Asian ethnic group in time-space.